According to the study by IBM Center for Applied Insights, on average, about 66 percent of mobile app projects eventually fail, usually within a few months after launch. In most cases, these failures can be traced back to mistakes made early on during the development or even at the planning stage – basically, mistakes in selecting a toolset. Therefore, a sensible and well-thought choice of a development platform and other tools can greatly alleviate many of these problems for both well-established mobile app development companies and small-scale firms. 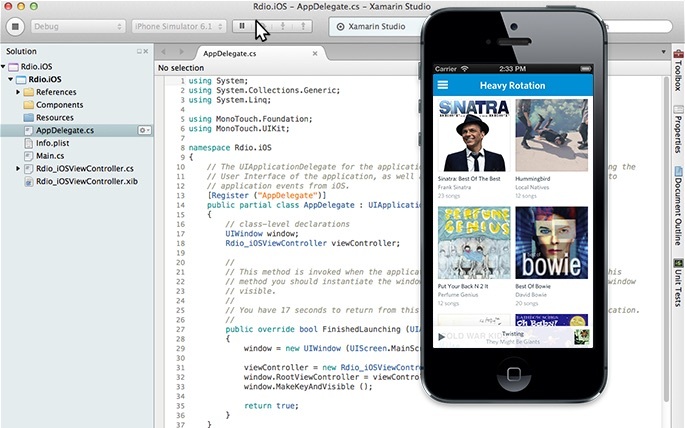 Xamarin is one of such tools, or rather a platform allowing for easy integration of numerous other tools and methods. Simply by selecting it as the basis of your development efforts, you can considerably decrease the amount of wasted time and effort. Subjectively speaking, it is more convenient and results in a cleaner code than in most other languages. For managers, it means that the job is done faster. Less time is spent on debugging and testing, and more on marketing and promoting the end result. Develop your app for a specific platform. This way you don’t have to coordinate between multiple dev teams and fully use the platform’s abilities. An easy choice if you favor iOS, Android or Windows in particular, but it forces you to leave money on the table. Develop for each platform separately. In the end, you receive apps tailored for specific platforms, but this approach means having multiple dev teams, codebases, and expenses that may be excessive for a small company. Use the Write-Once-Run-Everywhere approach. It is much cheaper, but modern users have too much to choose from to use an app that doesn’t use a native user interface or platform-specific hardware. When using Xamarin or other cross-platform development technology, the third option doesn’t seem like a bad choice. Xamarin allows you to retain the entire native UI across all the three platforms, share codebases and app logic between different iterations of the app, eliminate the need to duplicate dev teams as well as the actual code for every platform. According to “Pros and Cons of Mobile Development with Xamarin” John Barnett, it allows you to share up to 70 percent of the code between platforms, and in case you use Xamarin. Forms this value can grow to 100 percent. In business terms, it means that you save both time and money without compromising the quality and user experience. In the end, you receive an app represented on multiple platforms and working as if it was developed specifically for each particular platform – like, for example, this app by iFlexion. We believe that this change in approach signifies a new step in the evolution of app development in general, and we are likely to see many more mobile cross-platform development technologies vying for dominance in the near future. According to the Akamai Technologies “Performance Matters: 9 Key Consumer Insights” report, almost 20 percent of customers expect mobile webpages to load instantly, 30 percent expect the loading time to be less than a second, and 49 percent expect loading to take less than 2 seconds. The same goes for mobile apps, and in the future customers will be only getting more demanding. Therefore, improving end-to-end performance should be one of your primary considerations, and what can help you in this is mobile application performance monitoring (APM) by Xamarin. Unlike standard performance monitoring, mobile APM is aimed not at machine data and app metrics but at user experience. Although one may say that UX is something that can hardly be measured, it can nonetheless help to answer many questions. Does the app respond to a user’s actions quickly enough? Does a user understand how to achieve what he or she needs? Are the results it delivers relevant? The problem with a more traditional monitoring is that it pays most attention to front-end – in other words, to what happens on the user’s device. However, the bigger picture is much more complicated. All too often, it is the backend that influences the performance: API calls to payment processors, servers and so on. Xamarin helps to improve your app’s performance, so you will be sure that your APM pays the same amount of attention to the back end as it does to the front end. Xamarin Profiler allows you to run most of these checks without the need for any third-party software or analytical tools. According to Gartner’s analyst Susan Moore’s article “How to Deliver Mobile Enterprise Apps Faster”, by the end of 2017 the speed of app development will turn from an issue of efficiency into an issue of survival, due to the demand for enterprise mobile app solutions growing over 5 times faster than the ability of IT organizations to deliver them. One of the most characteristic features of Xamarin is its ease of integration and attention to customization – exactly what makes it so easy to use when combined with the Agile methodology. Optimization of mobile app development is a complex area that includes both increasing the actual speed app development and the quality of its support and updating after the release. It is impossible to single out any particular sphere and say that you should pay special attention to it while neglecting everything else – only by maintaining balance and seeking to improve every stage of the development process can you get ahead of the competition. Using Xamarin eliminates a number of problems from the outset: you use a time- and effort-saving programming language, don’t have to redo one and the same thing multiple times for different platforms and make the full use of native resources of all platforms. In other words, this platform has all chances to revolutionize mobile app development in the near future – at least if Microsoft will go on with their uncharacteristically open policy in everything that concerns it.